Hello! Just wanted to hop on here quickly & let y’all know that much like previous years, Lululemon has decided to run some special events today, on International Women’s Day! I heard that last year, some stores had 21% off, while others had in-store entertainment. Update: my local store had 18% off to bring awareness to the wage gap! St. Louis promises surprises, Denver offers free classes and live painting, while Milwaukee offers an opportunity to learn about the Sojourner Family Peace Center followed by a guided meditation. I will be heading to my local store today and I will update as to whether there is a discount there. Let me know in the comments what is happening at y’all’s local establishments! Author lululemonexpertPosted on March 8, 2019 March 8, 2019 Categories Lululemon InformationTags International Women’s Day 2019, lululemon International Women’s Day, lululemon International Women’s Day 2019Leave a comment on Happy International Women’s Day 2019! With Christmas- and Black Friday, and it’s cousin Cyber Monday coming up so very soon, I decided to finally make this gift guide! I have always wanted to make a “gift guide” of some sort, and I usually make an attempt at one, but I haven’t made one specifically for ladies who adore Lululemon- that doesn’t recommend a single Lululemon product. Without further adieu, here are some things I think make great gifts for Lulu-lovers. This defuzzer is great. I first wrote about this in my post about how to repair Lululemon, I included some photos of how I used it to fix an especially fuzz-ridden Cool RacerBack tank top, which I had purchased on a Facebook group. Sometimes, it’s easier to repair something than to go through the process of getting a refund. It’s perfect now, and I love it. I only use a fitness belt from time to time while jogging or going on a long walk, I usually use a mini backpack- but I like this one because it doesn’t seem to ride up the way other belts do. It’s pretty affordable and adjustable- which is what I like best compared to other belts. I would definitely recommend something a little more durable if you’re a daily jogger- for example, I’d consider this one: FlipBelt I used to use this one, and it is very durable, but I found that it would ride up on me when I ran. Solid choice for a daily runner though. OK, OK, I know, they look silly, and I’m pretty sure that no one even wears these anymore. But I love them- I have like 8 pairs and they’re perfect for me. I wrote a post about them a while back, and while I recommend them for everyone- that does exclude anyone with existing foot issues. The point of these shoes is to mimic natural running, strengthening the tiny muscles in the foot. However, if you have existing issues, it might be a good idea to wear supportive shoes prior to switching to anything minimalistic like these. If you happen to be interested, you can find them really cheap on 6pm.com, which is Zappos clearance site- or for better size availability you can check at Zappos. You can find them pretty cheap on Amazon too, but I would check 6pm first, because that’s where I’ve gotten them cheaply in the past- but it’s probably a good idea to check both sites. OK, now that I’m done talking about my favorite shoes, my second favorite shoes are these Nike’s I own. I wear these when it’s too cold for my Vibrams OR if I think the Vibram’s wouldn’t look good with my outfit. I love these Nike Free RN Flyknits, which you can find on the Nike website or other models for less on Amazon. Of course, you can’t go wrong with a pair of UGGs or Hunters either! I love my Hunters for muddy festival season, and UGGs are perfect for casual wear during chilly winters. I love my fitbit! I had a Surge for at least 2 years, and prior to that I had a Flex for two years. I now own a FitBit Versa that I adore. Any fitness enthusiast will love the step-counting, heart rate, and fitness-related functions, but I also like that I can see texts and phone calls without looking at my phone. It comes in handy in social and work situations. Ok, so not a fitness-related item, but I did want to mention these for a couple of reasons: They’re personal favorites of mine, & they’re having the best sale of the year on December 1st. They kind of smell amazing and their holiday scents really get me in the spirit. Right now, I’m burning a Gingerbread scented one I got a while back. I will definitely stop in to buy some on the 1st. Right now they’re buy 3, get 3 free- pretty decent deal already if you ask me. One of my favorite couponing channels on YouTube, Running Kimono made a video about these that convinced me to head in on the first of December to fetch some. I hope you liked this quick gift guide for people like me, who love Lululemon. I would also like to add that classes at local yoga studios or entry fees paid for local races would also likely be appreciated! Thanks for stopping by & I hope you have a very merry holiday season! Fall is upon us, and Lululemon releases some of their absolute greatest hits during the Fall season. Prior to [American] Thanksgiving (after which, they release giftable items- think staple pieces in black, grey, white and bright pink (usually)) Lululemon releases their best pieces of the year, IMO. That’s because they know that prior to Thanksgiving, their customers are shopping for themselves, and afterwards, they’re buying gifts for friends and family. So, right now, I have a few favorites to share with you- and a few things I think will go to markdown after the holidays are over. Note: Lululemon institutes as special holiday extended return policy, so if you buy something you like after November 2nd, but it goes on clearance online, as long as you haven’t worn it, you have until the 24th of January to return it- so, you could buy the item on sale online, and return the unused item to a store if you’re interested in arbitrage in that way. I usually can’t wait to pop the tags off a new item, but if you’re patient, you might be able to save some $$$-so long as the item actually makes it to WMTM. If it never goes on sale: well, At least you waited and tried? No big deal. Also: you can still return it if you think full price is too expensive. Next up: this Define Jacket in Scatter Blossom Jacquard Garnet Black. I know, it’s not shocking that I found a new Define jacket to love, but I really like the texture on this one- I know it is not going to be soft like the other Luon ones I have- since the Jacquard ones just aren’t soft like that- but it has an interesting texture and color quality that makes me like it because it is unique. Both are lovely, and I will probably pick this up in the black. It also comes in Heathered Medium Grey, but I have the It’s a Cinch Dress (2012) in that color already. Right now, and literally since they were released (!) I’ve been loving the Train Times Shorts. I only have them in Black, but they are super compressive and great for high-intensity activities. Full-On Luxtreme is good for those types of things. They have them available online only in a few blacks and various shades of black. These are gorgeous- they’re Wunder Under 1/2 Tights in Heathered Black, I’m betting they’re super soft too partly because of my familiarity with this fabric and partly because people are complaining in the reviews about pilling, which usually coincides with softness. I love that they’re hi-rise, but also only land just past the knee. Big fan of that particular combination. These are available online only, and I am probably going to pick them up! Now I want to talk about a few items that I think will go on sale, so if you like them you can probably hold off- but I could be wrong, so if you really love something, you should just grab it- and tell me how wrong I am about it on Twitter… go ahead an add me now @LululemonExpert I have been loving Twitter lately! So, what you’ll notice it that it appears that this is a two-layer item, but what it actually is is a hoodie with a detatchable dickie in the front- on the last photo you can see how it zips out. This makes the hoodie feel slick on the inside, and it is not as cozy as a traditional Scuba Hoodie, as I recall. This year, they have this online-only item, same as last year, called the “Scuba Hoodie Glyde.” I think these may be leftover from last year, since they also sold the Boysenberry color last season as well, but I could be wrong. The other reason I think these are left over is because there is no Black. Lululemon always releases items in black, so the fact that there is none is interesting. The reviews are all positive, but some say the jacket is short-ish, so if you’re long in the torso, this one may not be for you. These are kind of cute, but the price is just way too high, in my opinion. At $34, I think these will be marked down to $19 after Christmas. The next thing I think will go on sale are the Dance Studio Jackets with the ribbed sleeves. Not only do I think that the ribbed sleeves are not particularly cute, I remember that the re-released Dance Studio Jackets went to markdown as well. Personal preference: Anything with color-blocking is not the cutest, imo. Let me know what you think about my picks in the comments! Anything you think will go to markdown? Let me know what I missed! What are your favorites from recent uploads? In my last post about Ulta, I expressed some doubt that I would make it to the Diamond Rewards level. However, I did fall in love with some things this year, and I got a new flat iron, pushing my total above the required amount. Let’s dive deeper into these perks. It includes two sample sizes: A Pur: Fully Charged mascara, a “Porefessional” primer by Benefit and a $25 Beauty Services Reward Card. The samples are pretty self-explanatory. The $25 gift card is only applicable to Beauty Services. Prior to receiving it, I thought it was a $25 gift card for anything, but once I received it, I realized that it’s applicable only to beauty services- aka the Ulta Salon. This will probably not get used up for a while, as it is very rare that I use the salon at Ulta. For Members and Platinum Members of the Ultamate Rewards program, free shipping is earned after adding $50 worth of items to your cart. For Diamond members, this is cut in half to $25. Actually, I also received free shipping for purchases under $25 during Ulta’s 21 days of beauty promotion, when products that were a part of the sale earned me free shipping with purchase. I thought that was a nice bonus. A little math on getting to 2000: In order to get to 2000 points as a “platinum” member, you would in theory need to spend $1600, whereas a Diamond member would only need to spend $1333. I say “in theory” because Ulta is always having 2, 3, and 5 times the points offers on specific items or specific days or during your birthday month, etc… So, it is unlikely that anyone would actually need to spend so much, but you can definitely see the difference that extra 25% makes in your ability to earn! Whether or not this program is worth it to you is subjective. I prefer it to Sephora’s program, but only because Ulta offers cash to spend as a reward and not product samples, although, I had heard that Spehora has been experimenting with other rewards in the mix. What do you think about the Diamond Rewards program? Are you in? My has it been a while since I last wrote! I have been working hard, putting in the hours at work, and working on my YT channel. But mostly: It’s festival season and my weekends (when I usually write) have been filled with social activities. This past weekend, I went to Bonnarroo, prior to that, Italian Fest and before that, BBQ Fest, so it has been a little busy! Anywho- I wanted to do a little “What I’m loving right now” post, because I went to Lululemon last weekend, and got/ saw a few things I’d like to share with y’all! I did buy this. I like a good Energy Bra. They offer a lot of support, and, I think the straps are super cute. Of course, I needed a matching bottom, right? This skirt is super pretty. After reading the reviews, I’m seeing some sizing issues, I didn’t personally have any issues, but we all know Lululemon has had sizing issues before, so… maybe try before you buy on this one. This is so pretty too, and what I actually love most about it is the mesh fabric. This top reminds me a little of the Hot Like Agni tanks, because of the high neckline and ability to tie the back. I bought all of the Hot Like Agni tanks, and I got this Miles Ahead tank in this Ruby Wine color and in Sage. Sun Runners are BACK! So excited! I absolutely love the Sun Runners. I will definitely be getting these! The length is perfect, and the mesh in the back is so pleasantly cooling 🙂 The cut is pretty flattering too. Anywho- That’s all I have for now! Thanks for stopping by! It’s time to talk about Aligns. Aligns were released around September, 2015. They were released with a few other pant types when Lululemon was re-vamping their pant-wall. The released pants were the Align Pant, Zone In Tight, All the Right Places Pant, and Tight Stuff 7/8 Tight. And honestly, at first, I wasn’t all that interested. I prefered the “hugged” feeling of my Wunder Unders and the fabric seemed a little delicate… even moreso than normal! The other thing is that sometimes when Lululemon comes out with a new item, they phase something else out (Speed Ups replacing Speed Shorts) and then bring back the old favorite, at a higher price. So, I was biding my time, waiting to see what the Aligns were replacing, only to be phased out and to have the beloved classic item return for a higher price. But this has not happened and I am now convinced that the Aligns are here to stay. As an aside, What happened to the Zone-In tights? I’m not able to find them on Lululemon’s site and they were released at the same time. Anyways, I’ve never talked about Aligns before on my blog, but I think now is a good time to start. Fabric: Nulu: aka: softest Nylon/ Supplex blend ever. Fit: Form-fitting, not forgiving. If you have flaws, you’re not getting any assistance from these, unlike the way one might with Luxtreme or even the traditional Wunder Under Luon. That said, they fit pretty much like Wunder Unders, the fabric is just less thick and less tight than the WUs. Feel: These are the softest things I have ever felt from Lululemon. They really do feel like nothing at all on and I love this fabric! Issues: The reviews say it all. People LOVE the softness, but HATE the pilling. This is one of the reasons why I have stayed away from these. I can’t bring myself to pay $100 for pants that are destined to pill after only a few wears. In addition, people are complaining about loose threads/snagging. My opinion: Buy if you are not concerned about pilling. Let’s be honest, we all love silky leggings that are super comfortable to wear. Like a good lipstick, legging that feel like nothing at all are amazing. However, we also like our things to last, and based on the 2.5* average review on Lululemon’s website and given the extensive list of comments regarding pilling, I think it’s safe to assume that these do not last, for most people. And, while a depiller (CA) (USA) can help with this, the question becomes, should this really be necessary when I’ve only worn these a couple of times? I am so lucky that the people at Lululemon have heard me! I said: I want bright colors! They said, “Let me get the people at Saint Martins to whip something up for you! [again]” And it was done. Fabric is mostly Nylon, which is great! However, they are lined in white, which I don’t love because I fond that this meales the patter sheer out a little. I, however, did not find these to be sheer, nor did the pattern distort too much upon “application” to my body 🙂 The one complaint I have it that these slide down during activity. Glad I bought them! I went back and forth a little bit on this one, but the Quartize Wunder Under Nulux Multi is my favorite from this collection and probably the one I want to get my hands on ASAP. So pretty! I love this blue/green color! The print design itself reminds me of a black/ white print Lululemon had called “Marbled Mix” and another in engineered print Nulux called Multi Black. And I almost got those ones, but didn’t because of the waistband and because I found them a tad sheer in a bend. I always am extra vigilant around Wunder Unders lined in white, as they tend to be more prone to sheering out. If they get all of these in my store, I’ll go do a try-on/ fit review for y’all. I went on Tuesday, but they had not yet arrived. The one, that I’ll call ‘tied for first’ on my list is the Kascade Wunder Under Multi. This one is sooooooo pretty! I love the variations/ stops in pattern just the way it looks- I bet it will be very flattering! I’ll let you know! The next one on my list: Tulle Wunder Under Multi. I like this one a lot, but don’t love it and will likely pass, but it is still gorgeous. I love how feminine this print looks. The lines in the print seem so light and dainty. Finally, the last one. Although I do like this print, I do not love it. The colors are nice, but the print itself is too geometrics for me. Not my fave. What do y’all think of this collection? Let me know in the comments below! In case you didn’t know, I started a YouTube channel. That said, while I really love making makeup videos- ACTUALLY I just uploaded my NEW favorite, a review of the Elsa palette by Beauty Creations. My other favorite was the review on the House of Lashes eyelash glue– why did I smell the glue!? …As I was saying- While I do really enjoy making fun, makeup videos and haul videos, I also really want y’all to get to know me better and to start introducing some vlog-style videos on my channel, where it is literally just me, talking to the camera. And while even I do not honestly believe that I am that particularly interesting, I do think that some of my stories and experiences are at least mildly interesting in that “human interest” sort of vein. That said, I do plan to get personal with y’all and really put myself out there. My first vlog that I publish will either be me volunteering at the Humane Society OR a Storytime about my experience with homelessness. I have both almost completely filmed and edited, but want to put an extra segment onto both of them before I publish. I really love to write, I am really enjoying filming (editing is OK, lol) and I am actually probably too passionate about Lululemon and all things Beauty- BUT I also want all of you to get to know me better and I think that by starting to vlog and telling stories about my life, that that will help you get to know me a lot better. I hope you enjoy the vlogs. I definitely got the black one, and I don’t even wear black that much. I might go for the other two if they don’t sell out too quickly. The second thing I am LOVING are these Crystalline Multi Wunder Unders. I don’t love that they’re lined in white- and sold out in my size at my local Lululemon- BUT, they’re gorgeous, and I’ll probably end up with something in this print in my hands some time soon. I am absolutely in love with the new collection that first arrived in Asia and has migrated to the United States. These Carmine True Red/ Black Train Times crops will be mine. As soon as I saw them on the US site, I leapt from my bed to run to my local Lulu in search of the awesomeness. They did not have them- and sadly I had forgotten about the “Find in Store” button option on the item page. I did, however, pick up the matching Sweat Times Bra. Very nice indeed. So many appealing items! The Stash N’ Run bra looks just like my beloved Run Stuff Your Bras, minus the middle pocket! But that’s OK! I’ll give them a chance once more colors are released. Then there’s the Wild Twist 7/8 Tights! I love these! I KIND of wish the “Magnet Grey” part was reflective, but hey, you can’t always get what you want! Worth noting that there does appear to be a tiny strip of reflective material at the base of the tights. But I just love these! They seem so fun 🙂 This colorway is called: Black/White/Magnet Grey. They also have Redwood/Auburn/Quicksand, which I don’t fully love… I hope they come out with something more vivid, and less muted. Because I love them, and because I love seeing them back, I hope that more colors come out and that y’all get to enjoy these! What do y’all think? Let me know in the comments below! So, basically, I love Ulta- BUT I think their Diamond program is reaching a little bit. By comparison, Sephora’s Rouge requires “only” $1000 spent per year to become a member and provides the major benefit of free shipping. (However, the same benefit can be purchased for $10/year from Sephora.) 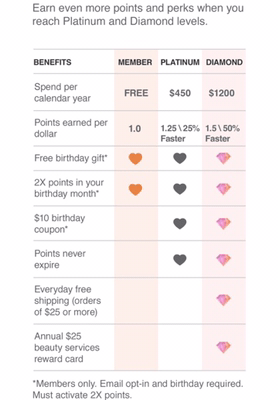 By contrast, Ulta’s Diamond rewards program membership does not offer free shipping and requires a $1200 spend. It only changes the minimum order requirement from $50 to earn free shipping to $25 to earn free shipping. Honestly, my orders are never lower than that anyways, but it still seems like if Sephora can do for $1000, Ulta can do it for $1200. So, if you earn points 25% faster (On BASE points only, this multiplier does not affect 2x or 5x the points values), you now “only” have to spent $1333 to earn the 2000 points (assuming you activate no other points offers), whereas with Platinum, you must spend $1600 to earn the $2000 points, which in my last post, we established is the ideal increment in which to spend. The relative value- of the extra points you get for not having to spend $267 to earn them is $20.86. In addition to the $25 gift card you receive for being a Diamond rewards member, the total benefit of being a Diamond rewards member is $45.86 + a lower free-shipping threshold, which anyone spending $1200/year at Ulta is unlikely to use anyways amiright?. So, if spending $1200/ year at Ulta is something you generally do, by all means, continue to do so. But in my opinion, I would prefer to remain Platinum and get all the perks associated with the Platinum membership, rather than attempting to become a Diamond member. If I spent $1200 on makeup per year, I’d probably go for the Rouge membership at Sephora. Free shipping (although non-rouge members can purchase it for $10/year), early access to sales and new product launches, and exclusive events seem more worth it to me than what Ulta is offering. I, however, barely made it to Platinum this year, so I will not be going for Sephora’s Rouge program. But if you’re trying to choose between the two- I think Sephora wins the round for “best top tier,” but Ulta still wins for best mid-tier. In my opinion, Ulta’s rewards for being platinum are better than Sephora’s rewards for being VIB. What do you think of the new Diamond tier in the program? Let me know in the comments!